By the time the last major units of the British Army leave Bielefeld, Gütersloh and Paderborn in 2019, British Forces will have been stationed in Germany for nearly 75 years. British Forces in Germany – The Lived Experience. Hundreds of thousands of Forces personnel have experienced life in Germany: not just military personnel, but tens of thousands of civil servants and support staff from within the teaching organisations such as MOD Schools, civilian doctors, dentists and nurses in BFGHS / DDS and engineers and project managers from DIO. Every one of these people has a tale to tell. 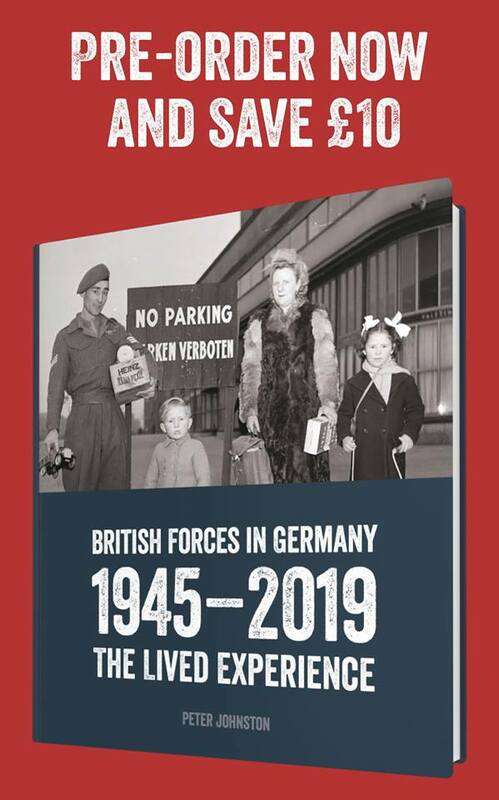 British Forces in Germany 1945-2019: The Lived Experience is split into decades and covers important military strategy, political events such as the Berlin airlift and the fall of the Wall, but also the experiences of British soldiers and the increasing integration of British troops and the German population, and their domestic and family lives. If you pre-order the book before 15 May 2019, Publisher Profile Edition is offering a £10 discount on the RRP of £35 (plus p&p), and the opportunity to list your name(s) in the book.